3. Add the ginger garlic paste and saute for 5 to 8 minutes. 4. Add the lamb, salt and cinnamon stick. 5. Saute for a few minutes. 6. Add enough water to cook the lamb till tender. 7. In another pan, brown the sugar. 8. Add the apricots with the soaked water. 9. Bring the mixture to the boil. 10. Lower heat and cook till the apricots turn soft. 11. Mix the apricot mixture with the cooked lamb. 12. Cook for a few minutes more. 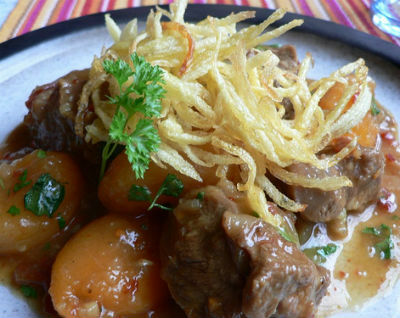 Feel free to comment or share your thoughts on this Jardaloo Ma Gosht (Parsi Lamb with Apricots) Recipe from Awesome Cuisine.